In addition to this Granville Phillips 360, Capovani Brothers Inc stocks a variety of used multiple gauge controllers. Typical manufacturers include Edwards Vacuum, Granville Phillips, HPS, Kurt Lesker, Leybold, MKS Instruments Inc., and Agilent Varian. 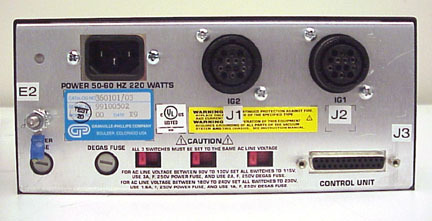 Cable between controller and the power supply included. This controller can be calibrated for different ion gauges, calibration for each channel is loaded via memory modules. If you have standard Bayard-Alpert glass gauge, CBI can upload average calibration for that gauge with sensitivity 10/Torr to channel one, two or both. If you have Stabil-Ion gauge with individual module containing calibration for that gauge, you should upload that to the controller before using it. If you have Stabil-Ion gauge without individual module, CBI can upload average calibration with sensitivity 50/Torr to channel one, two or both. Specify type and sensitivity of your gauges when ordering.